Wow, it’s quiet. This is really nice. Why is it so quiet? Where is everyone? Who cares where they are or what they are doing. I’m going to sit here and enjoy it. But remember the last time you sat there and enjoyed it? It didn’t end well. This happened on Sunday afternoon. Eventually I came around to that point where I thought I should probably go check and see why everyone was so quiet. I walked all the way up to the third floor of the house, and I could hear Sam and Abra inside their room. Loud music reverberated through the door, and their little voices were singing away. Nothing to fear. I have a good friend named Seth. We’ve never met in person. It’s a strange world we live in now, that I can become good friends with someone in Arkansas whose face I’ve never seen in real life. The cave of the soul is the sacred space where you go to be alone with God and to listen and to hear and to experience his voice and his calling. The voices we find in the cave of the soul that are distractions, those voices are intruders. But so often we keep them captive. They crush us with doubt and anxiety and fear and pain. But instead of releasing them, we hold them captive. I think that what God sometimes asks us to do is to allow the intruders the freedom to be let go. To say “I am enough, the spirit work in my life is enough” – no matter how small it might seem – “and the cave is my sacred space.” So, intruders, you are given permission to leave. 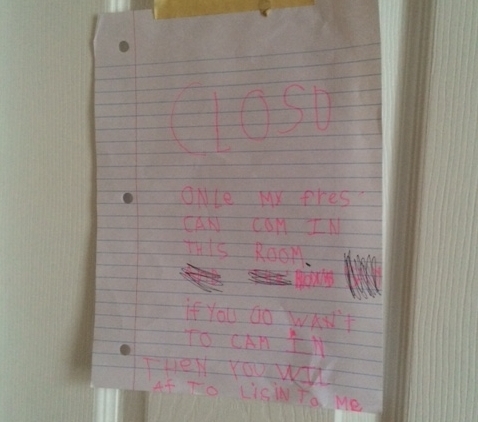 All of this to say, I think I need to take a page from my daughter’s book about who she lets into her room. If you want to come in, Intruders, then you will have to listen to me. What do your intruders say to you? What intruders do you have that you need to give permission to leave? This Saturday night I’ll be doing a reading of The Day the Angels Fell at a friend and fellow writer’s house. Kelly Chripczuk is hosting the event in Boiling Springs, PA. For more details, check out the Facebook event page HERE or email me for details. Children are welcome to attend, but we do ask that you RSVP. I’m giving away five signed, paperback copies of The Day the Angels Fell over at Goodreads this week. You can enter the giveaway HERE. If you’ve read the book, please consider heading over to Goodreads and/or Amazon and leaving a review (every review helps give the book more exposure and introduces it to potential readers). Similar to a piece of advice I read by an Orthodox priest, to give evil thoughts nothing to “hold on to”. Not to resist them, nor fight them; just let them blow through, giving them no where to grasp. I find this helpful. Can’t wait to read your book, by the way!